Special Interest Group (SIG) on Technology Enabled Learning (TEL) and Quality Enhancement (QE). 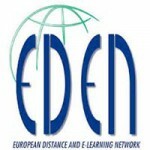 EDENs President Airina Volungeviciene både inledde och avslutade konferensen med hur EDEN ska bidra till att utveckla den internationella kvalitetsagendan relaterat till TEL for quality enhancement. ”The aim is to work through EDEN NAP and to involve members as experts, but is also for everyone with an interest in QE and TEL.